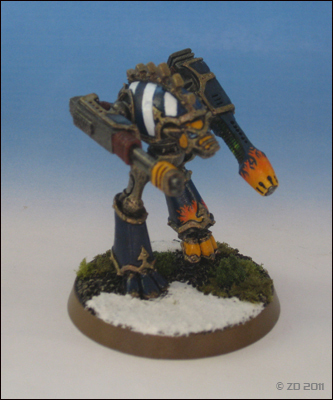 The first of a pair of Warp Runners Warhound Titans. This Titan's loadout enables it to launch flank attacks and ambushes using its weapons to knock out enemy armour. Both the Plasma Blastgun and Turbolaser Destructor is perfectly suited for dueling with Main Battletanks and other light to medium sized War Engines and Titans. It has been known to catch heavier Titans out as its speed allows is to get behind them and target vulnerable locations such as exposed Plasma Reactor housings and Carapace Void Shield generator manifolds usually only targetable at the rear of the larger Titans. Following on from my convention of naming my Titans, I name this Warhound Primoris Venator. In terms of painting this, I followed the same method as I used for my Warp Runners Warlord and Reaver - the rich blue and gold motif of the Warp Runners legion. The base, again, follows the same techniques and snowy terrain look. I expanded my technique for painting flames further on this Titan. I started off using a basecoat of Vallejo Game Colour Dwarf Flesh and painted on the flames as they licked and burned. This was followed by Vallejo Elf Flesh. I find using these colours as a good base for richer oranges and yellows. They also are a lot smoother than white in terms of the final finish for painting brighter colours over darker colours. After that, I used various wet blending techniques to start from a bright golden yellow at the bottom hottest part all the way up to a deep orange for the cooler part of the flames.